@doctorfusionbebop: Some 17 y. o. chick named Dee Guerrera was just sent to Alcatraz 2.0 for killing her stepsister. So, how long do you think she'll last? @morrisdavis72195: I hope she meets justice! She'll get what's coming to her! BWAHAHA! @EltonJohnForevzz: Me? I think Dee's innocent. And I hope she can survive. WELCOME TO THE NEAR FUTURE, where good and honest citizens can enjoy watching the executions of society's most infamous convicted felons, streaming live on The Postman app from the suburbanized prison island Alcatraz 2.0. When seventeen-year-old Dee Guerrera wakes up in a haze, lying on the ground of a dimly lit warehouse, she realizes she's about to be the next victim of the app. Knowing hardened criminals are getting a taste of their own medicine in this place is one thing, but Dee refuses to roll over and die for a heinous crime she didn't commit. Can Dee and her newly formed posse, the Death Row Breakfast Club, prove she's innocent before she ends up wrongfully murdered for the world to see? Or will The Postman's cast of executioners kill them off one by one? A book about legal murder? Sign me up! 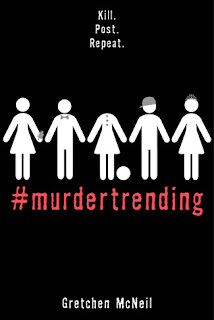 This book combines a currently corrupt society with good ol' fashioned mystery. Which is always fun. It has so many layers to it that can be confusing if you're not following closely along. If you think you know what's going to happen next, you're probably wrong. But confusion is really what makes up a good mystery. This is like the Purge, where murder is legalized (in the movie for the 24 hours and in the book for people in this particular prison), mixed with Nerve where the videos are out there for everyone to watch and enjoy, no matter how sick it may be. There are parts of the book where it shows the comments people "posted" in the book on the videos of the prisoners, which I though was a very clever detail. It gives the reader an insight into the minds of society, not just the main character and those on the island with her, in this version of reality. The main character in question, Dee, has so much going on, AND IT'S ALL CONNECTED. Her creepy past, the fact that she's being framed for her stepsister's murder, and more than that, the fact that she's living on an island where she could be killed at any time with a bunch of convicted killers. The only issue I had with her was how trusting she was during the entire book. After everything she's been through, you'd think she'd learn, but no. Other than that, she is a pretty good person, which is a good thing for a main character to be. Overall I enjoyed this book. It's interesting and it makes your brain work to connect the dots. It's intense, definitely not something you pick up for a cute, fun, or fast read. 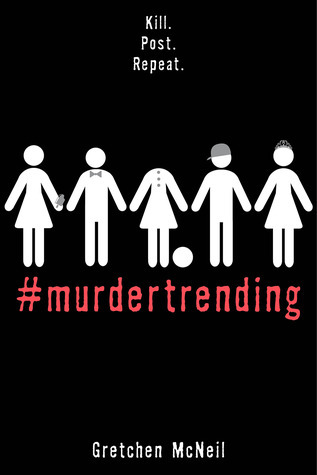 If you liked movies/books like Nerve, or the Purge (as mentioned before), or even the Hunger Games you'll realllllllyyyyyyy love #Murdertrending.